Swedish star cross-country skier, Charlotte Kalla, was shown a video of South Korea’s dog meat industry and was very saddened by it. Swedish news Expressen, published on February 7, 2018, reported the peoples’ reaction to Charlotte, applauding and thanking her. We are thankful to Charlotte for her compassion and courage in speaking out for the millions of Korean animals in the horrific dog and cat meat trade! You are a true champion and we love you. PYEONGCHANG. Charlotte Kalla is being honored before the Olympics has even begun. The reason? An emotional reaction in a tv-spot. Charlotte Kalla, 30, has landed in Pyeongchang. The pride of Tärendö is doing her final preparations for the 2018 Olympics, which kicks off on Saturday. Skiathlon is on the schedule and Kalla is one of the big favorites for the gold medal. But with just a few days left to start, she is getting headlines for something else in South Korea. An activist group that is struggling to end the abuse of dogs and cats in South Korea has chosen, on their Facebook page with 70,000 followers, to draw attention to Charlotte Kalla. The reason for that is a tv feature on Expressen TV, where Kalla shows a strong reaction when she sees how animals are treated in the Olympics host country. “I had never heard that dogs are treated like this in South Korea, it’s horrible. I didn’t know anything about this,” she says in the tv feature. What were your feelings when seeing this film? When SportExpressen got in contact with Sharon Ferguson, she said that Kalla’s action can make a difference. “Things like this are the only way to make those in charge really see the problem. When an athlete like Charlotte Kalla says something and shows that kind of reaction, people are listening. I’m truly impressed by her, that she took the time to see the video and that she let herself feel the pain,” says Fergeson. Dog meat is a big industry in South Korea. There are more than 17,000 farms where more than 2.5 million dogs are bred each year, according to independent sources. The meat is used to make food, especially during the summer, but is also used in alternative health food. Dog meat is believed to bring energy even though there’s no science supporting that. The conditions on the dog meat farms have received tremendous criticism lately. The International Olympic Committee (IOC) has had to defend its decision to hold the Olympics in South Korea. “Our main mission and responsibility is to guarantee the best possible conditions for the athletes. We are not mandated to take action against independent states,” they wrote in a statement. Photos: Sharon Ferguson volunteering at the SaveKoreanDogs.org rescued dog sanctuary. 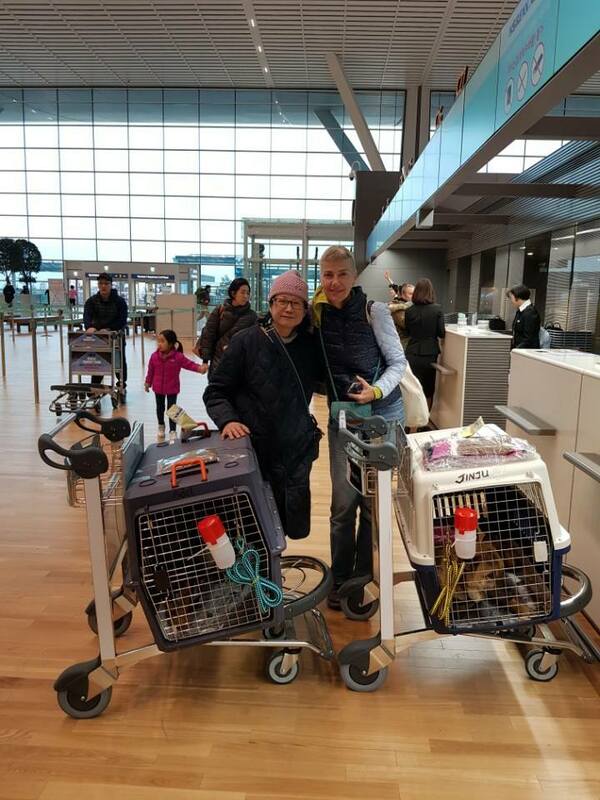 Sharon flying with dogs as flight volunteer, at the Incheon International Airport in South Korea with Nami Kim. February 15, 2018. 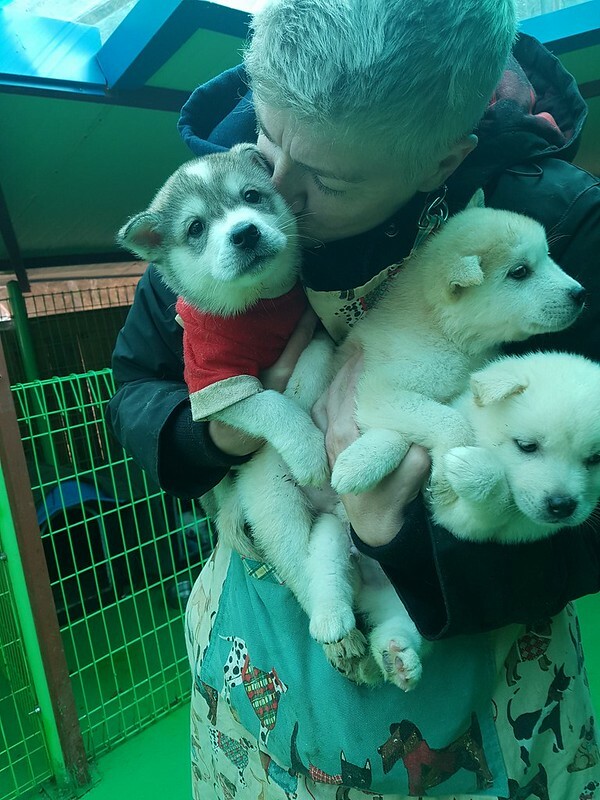 Nami Kim (of SaveKoreanDogs.org), is a Diamond. I’ve met her & followed her work since 2015. With very limited resources she’s battling seemingly insurmountable odds. Nami endures almost daily set backs to the cause of ending the, particularly heinous, cruelty (driven by superstition) of the dog meat trade, but carries on the fight at great personal cost. She also suffers regular personal set backs due to the banal yapping of some idiot element of social media, but carries on fighting regardless. She does, however, have friends & allies on her side (even some sympathetic government ministers) &, against the most unlikely of odds, has managed to close down some dog meat farms/torturing factories (literal intentional torture instead of ‘clean killing’) ending the particularly intense suffering of hundreds of thousands of animals. I personally don’t believe she has received enough credit for these impressive achievements, probably not helped by the fact that Nami is not one to blow her own trumpet.